A 60 y o female brought unconscious to casualty. On Admission MRI T2w images show T2 hyperintensity confined to centre of Pons. No abnormal restricted diffusion on Dw images. Changes of small vessel disease. Brain Angio show no significant major vessel stenosis or occlusion; Normal basilar. Imaging diagnosis: Central Pontine Myelinolysis. ODMS may occur in Normonatremic patients (Reports with normal Na+ levels). Neoplasm: Imaging Pontine Glioma may confuse with CPM. Clinically CPM has acute debilating course. 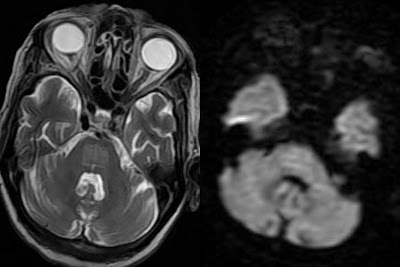 Pontine Glioma pt will be young, clinically stable with slow progressive symptoms, without any history of hospital admission or osmotic corrections.